Micheal of Daniel 12:1 is Number 9 and child of Revelations 12, and is not the IMAGE made of him. Does anyone really know what time it is? Its not that I think Dylan in “All Along the Watch Tower” was wrong about the hour getting late. It was more like he was right about many among us thinking life was but a joke. Which has lead US to just wasting time. Even Eisenhower saw a day when the people would demand Peace so much that the govts. Would have to get out of the way and give it to them. So if these are the latter days spoken of by Daniel, the Lamb and other Prophets… Not just Biblical ones. For even the Native American Indians saw a generation coming which would stop destroying this Beautiful Planet. How will these latter days be played out? I got clue back in 1994 after I felt I had a purpose when my Mom gave me an article about the Mondragon Cooperative of the Basque in Northern Spain. I saw right away how Unions here in America could work out the details of the wealth being spread out through work. In Mondragon you cash in your shares as owners of the company upon retirement, and that even includes a Social Security check. There has to be a way to fulfill Isaiah 23:17-18 where it says the wealth is spread out. Even if it means throwing the kings of the earth in jail as Isaiah 24:21-24 says. All of this would surly lead to that big party of Isaiah 25. Then I saw on CMT for about the 1000th time Little Texas here as I had always sang it: “Rocking Down Angels from the Promised Land. I said to myself, while on my knees, before the TV mourning about a love that wasn’t working out, “That is what happened. We all came down from above. Boy have we been told some trash about these latter days we are living in.” Then I said, “Woe, I’m Michael. I can’t tell anyone this or they will think I am crazy.” Well 4 days latter a Man on the phone completely out of the blue, told me about the war in heaven which was thrown down here to earth in Revelation 12. Which dragged a third of the stars out of the sky. Well, I looked it up and saw 12 stars on a women’s head, with there being 12 Deweys counting my parents. (of which I was #9 or #11!) My Mom had recently told me I had taken 4 days to be born, and the women was travailing to give birth. And to top it off the child to be born after John’s Revelation. The child was caught up to god and his throne; which I saw after getting knocked off of a 6 foot ladder by 277 volts going in one hand and out the other grounded to an emt pipe, back in 1982. My foreman came around the corner as a was shaking in a seizure on the floor, as he told me latter along with how he thought he had rushed me, and that he thought I was gone. For at least months latter I kept asking why I was still here, for there was an imprint in my mind of a white throne. Since I had just recently left the born again church, I thought I had done that unforgivable sin, and had been judged. The jukebox came alive more than with just this Neil Young song Hurricane.-for I had seen this little blond in a crazy hazy bar right after my fall from a ladder… And boy did that ladies emotions cut me open (for no good reason. )in 1994 as Neil sings. After being driven from Abbey Road and Forty’s Club. Some of which was my fault. 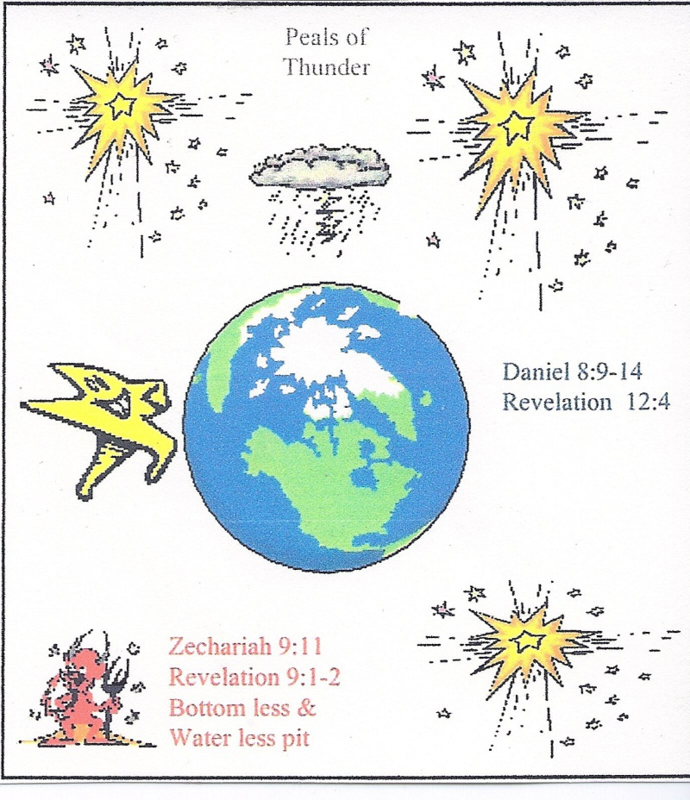 But I found what was sealed up in Daniel 8:9-14 which Daniel 8 says twice was about the latter days, was that stars and hosts were dragged out of heaven and trampled as humans.-that is the only interpretation which could ever make real sense. For doesn’t Daniel 12:1 have to have some meaning to this age, for it is there that says Michael arise? Another thing that you can be sure of is that I feel like Rod Stewart, when he sings this Rhythm of My Heart is Beating Like a Drum, for true Peace and Liberty, as he sings in this Song. Charitable Donations to keep spreading the rekindled not moral enough to kill bench movement. This entry was posted in We Are The 7th Generation. Tagged endtimes, latter days, new age, These Troubled Times.